Offering free Wi-Fi, this guest house is located in Barcelona’s Sant Gervasi District, close to Fontana Metro Station and only 5 minutes from the city centre by public transport. Barcelona City Street features single, double and triple rooms with flat-screen TV and a kettle. 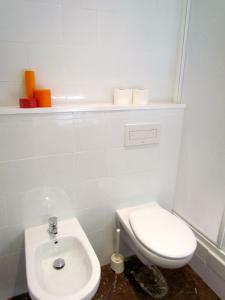 All rooms have a private bathroom, most of which are located within the room. Breakfast is served daily. The property has a lounge area and a kitchenette with a microwave and fridge. There is also a lift in the building. The charming Gracia District is within walking distance of the guest house. Here you will find numerous theatres, small shops as well as cafés and restaurants serving national and international food. Diagonal Avenue and Passeig de Gracia can be reached in less than 15 minutes’ walk away. Please note that it is possible to check in at the hostel until 20:00. Guests arriving after 20:00 can check-in free of charge at the chain's main office. Please contact the property directly for further information. A public car park is available near the hostel with discounted rates for guests. Reservation is not needed. Please contact the property for further information. Please inform Barcelona City Street in advance of your expected arrival time. You can use the Special Requests box when booking, or contact the property directly with the contact details provided in your confirmation. This air-conditioned room includes a TV, heating and a kettle. The private bathroom comes with a hairdryer and is located in the corridor. Rate: € 29.01 ... € 106.96; select dates below to get current rates. This air-conditioned room includes a TV, heating and a kettle. The private bathroom comes with a hairdryer.